The light commercial Fitnex T60 treadmill is suitable for heavy home use, corporate fitness centers, hotels, and personal training gyms. It has a lot of appealing features, such as incline capability, lots of workout programs and a high max user weight capacity. The Fitnex T60 has a profile matrix and 3-window LED display to show speed, time, distance, elevation, laps, calories, and pulse rate. Unit Wt/Dimensions: 255 lbs / 81" x 34"
UPDATE: The Fitnex T60 was recently redesigned, but retains most of its main features. There are currently three Fitnex treadmills remaining in the lineup: the base T35, the mid-level T60 and the top of the line T70. There is also a kids treadmill called the XT5. Although they are decent treadmills, we would opt for one of the higher end treadmills from NordicTrack or one of the base models from Matrix, Life Fitness and Precor. These brands are much more well established, and they are constantly updating their product lines to incorporate new technology. Fitnex by comparison appears to be behind the times. 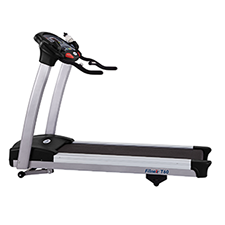 More detailed specs on the Fitnex T60 treadmill include a 3.0 chp PWM motor control system, 2.5" precision-machined industrial bearing balanced rollers to reduce vibration, a 2.1mm 2-ply belt with speeds of 0.5 to 10 mph, an 8-point elastomer system cushioning, and a one-inch thick deck. The elevation motor delivers 700-lbs of thrust to raise the incline up to 15%. The training programs include a heart rate control workout that can be used with the hand grip sensors on the handlebars or the wireless telemetry (a chest strap must be purchased separately). Among the rest of the 26 preset programs you get 3 walking courses, 3 running courses, 3 cardio, 3 fat burning, 3 endurance, 3 interval, and 6 custom learn programs. Reviews give the Fitnex T60 praise for its power, quality, quiet noise level, and cushioning, but only average marks for value. This value estimate is based on an average sale price on the internet of $2,099; but be advised that it has been listed for sale on Amazon.com for as low as $1,820. 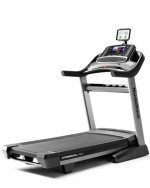 The quality-built Fitnex T60 treadmill has been around since 2005 and hasn’t changed much in the technical aspects although they did upgrade the design from silver to a more stylish dark grey color. This is a powerful machine with some nice points, but when you buy it for $2,000 it needs to outshine other brands. Even if you can get it for around $1,800, you should still check competitor models and see if you want to get a machine that offers more features and a better warranty.